To my surprise there isn't any transport problem to Keren (that will celebrate its annual Festival of Mariam Dearit). There is a small Toyota minibus waiting. "Keren?" I confirm my destination. The drivers judges the tourist, and his rucksack. I guess he has pity on me. "That bus is better for you". He points at a large, very old Italian bus, that has a lot of free seats. I get into the bus. The passengers are directing me to the middle of the bus. But I want to sit in the back, so I can easily get in and out at the checkpoints. Suddenly all passengers are leaving the bus. The reason is obvious. 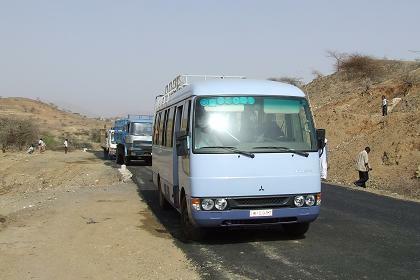 Two small Mitsubishi Rosa buses offer fast, comfortable and cheap transport to Keren. I am lucky to have a seat in the front, next to the exit door. 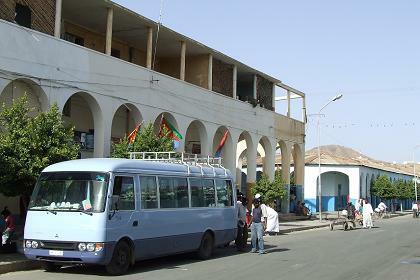 I write the license plate number of the bus, and "26/05/2009 Asmara - Keren" on two of the copies of the travel permit, so the registration will be a matter of seconds at the checkpoints. There is a one our delay just before Keren, because they are renewing a few hundred meters of tar road. 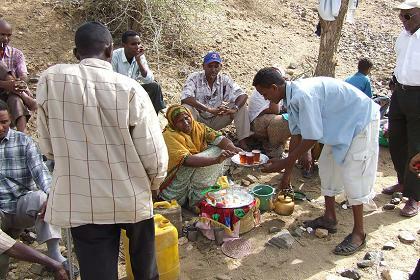 The local population immediately starts providing the stranded travelers with tea. My neighbor passenger invites me to have a cup of tea with him. In bar and fast food restaurant Tnsaie Midry Babur at the Keren bus station, I enjoy some fruit juices for lunch. Children are selling peanuts. I add some to my lunch, for a few Nakfa's. The afternoon, I spend visiting friends and drinking lots of mineral water. It is very hot in Keren these days. In one of the shops I buy a bottle of araki to add to the gifts I brought for Hansu and Afworki. In their house Hansu welcomes me with coffee and kitcha. She knows I like it more then injera. My room is prepared. A nice bed with clean sheets. The three colorful beach balls I gave her four years ago to hand to Bereket, are still on the couch. I ask her why she never gave them to the child. "They make me happy, and remind me of you" she says. It couldn't be a warmer welcome. Makeshift teashop - Road to Keren. Stranded Misubishi bus - Road to Keren. 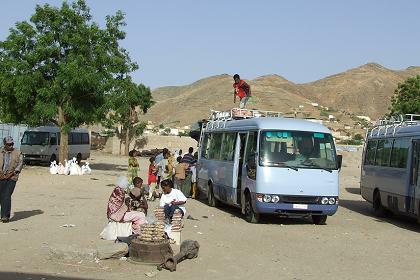 Bus stop in Keren - Keren Eritrea. 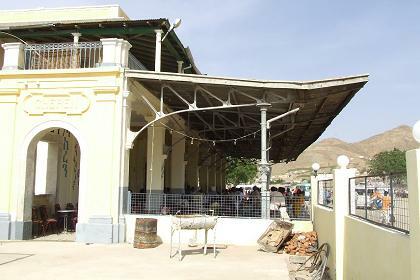 Main bus (and former train) station - Keren Eritrea. 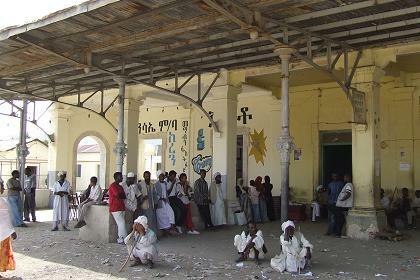 Bus (and former railway) station - Keren Eritrea. 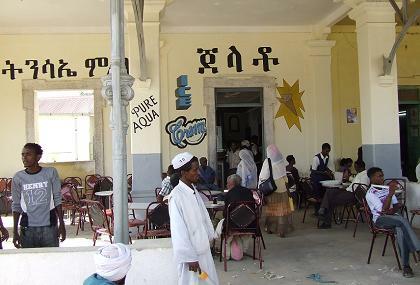 Main bus (and former railway) station - Keren Eritrea. 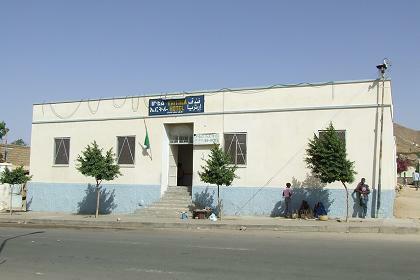 Bus station - Keren Eritrea. 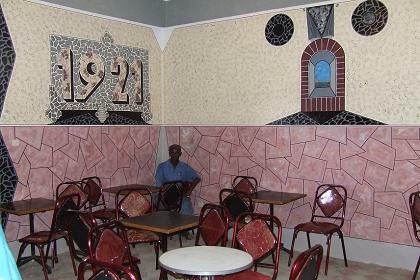 Eritrea Hotel - Keren Eritrea. 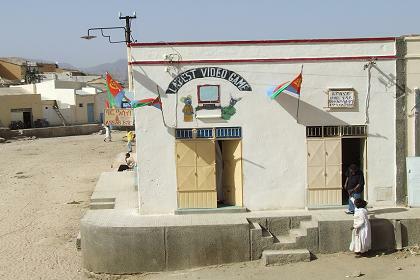 Video games shop - Keren Eritrea.